NEOPIA CENTRAL, LIVE - Hello again! I’m Kuszemi, and I’m here today in Neopia Central to pick up the Grooming Parlour Shopkeeper. We’ve been acquainted for quite some time now, and she’s been doing a roaring business, so I suggested that she expand into some of the other markets, such as Krawk Island, maybe. (coughs shiftily) I promise this has nothing to do with a certain pretty barmaid, and everything to do with the fact that we finished celebrating Krawk Day not so long ago. Anyway, we’ve planned a trip there together to conduct market research, and to better acquaint ourselves with Krawk fashion. We might even visit The Golden Dubloon for a drink or three, and see if, eh, we run into anyone interesting. Kuszemi: (knocks on the rather gaudy purple door of the Grooming Parlour and walks in). Grooming Parlour Shopkeeper: Oh, what a super wonderful day! Can I interest you in anything? Kuszemi: It’s me. We’re supposed to go to Krawk Island today. Are you ready? Grooming Parlour Shopkeeper: Oh, yes, absolutely. Let me just check to make sure that I’ve brought along everything I need for my trip. Yes, so that’s my Sparkling Usuki Eye Shadow, my Sparkling Usuki Lipstick, and where is my Usuki Powder Puff? Oh good gracious! Oh wait, here it is. Kuszemi: I’m not sure that Krawks would be partial to powder puffs and lipstick. Or most pirates, for that matter. Grooming Parlour Shopkeeper: Oh, you silly Usul. They’re for me, of course! Well, I think that’s everything! (jumps in fright as a Red Pteri materialises in front of them) Oh, it’s you again. I thought I told you to stop doing that, it gives me a real fright every time you pop up like that. What do you want now? Grooming Parlour Shopkeeper: I can’t eat chocolate. I’m on a diet. Kuszemi: What, why? You look fine. And I like chocolate. Kuszemi: All right, all right! Let’s go. (to the Red Pteri) See what you’ve done? I hope you’re happy. Kuszemi: Well, that was strange. Kuszemi: Well, here we are finally. Warf Wharf. No, not that way. That’s Krawk Island Nippers. Unless you fancy a Pirakeet or three. Grooming Parlour Shopkeeper: No thank you very much. I don’t like the way they leer at me. Grooming Parlour Shopkeeper: Oh. Oh, my. I can see that I certainly have a lot of work to do. Oh, you poor thing! This poor scruffy boy here could certainly do with a nice pair of Gnorbu Shears. Pirate Gnorbu: Oy! Mind ‘oo you’re callin’ scruffy! I ain’t scruffy! Grooming Parlour Shopkeeper: (wrinkles her nose ever so delicately) Perhaps some Lavender Soap would sell nicely here. Actually, all sorts of soap. I have quite the collection for these lost boys. Maybe a Bone Soap would appeal to their tastes more, and whilst we’re at it, a Voidberry-Scented Bath Salt wouldn’t go amiss either..
Kuszemi: Seaweed Peophin Toothpaste would sell like hot muffins here. And you could buy the seaweed locally and cut down on shipping costs. Actually, you could get lots of material here, like Natural Sponge and Blue Scallop Mirror, and we could probably even hire locally. We could really get the economy going. Grooming Parlour Shopkeeper: Oh, we could, we could! (sees the Pirate Usul) Oh goodness gracious, whatever happened to you? You certainly need some Red Blush to fix that terribly pale complexion. And do you even wash regularly? Look at all those split ends on your tail! Right, mister, you definitely need a makeover. I would have to bring out my Ultimate Usul Intervention Kit and probably invent a few more items for a case as extreme as yours. You would certainly need Usuki Magical Conditioner and Usul Tail Shampoo, and an Usul Exfoliating Brick too. Pirate Usul: ‘Ere! Don’t ye try ter change me wi’ yer newfangled landlubber nonsense, poppet! Grooming Parlour Shopkeeper: Oh! Well, here’s the kit, in case you ever change your mind. I’ve also included my rare, limited-edition Usukicon Y12 Personal Deodorant, Usukicon Y17 Perfume and Usukicon Y8 Magical Hair Brush. (to Kuszemi, with a preen) I’ve never missed a Usukicon before in my life. Kuszemi: I can imagine. Well, I’m getting a bit hungry, what say we call it a day and go to The Golden Dubloon and grab a bite to eat, and come back here tomorrow? Grooming Parlour Shopkeeper: (frowns in thought, her perfectly plucked brows coming together in concentration) We could. I certainly have enough material to keep me busy for the time being. And I’ve always wanted to try the Pirate Diet. Sally tells me that she really saw a difference after only eating Headless Horsefish for a week, although I can’t say it sounds very savoury to me..
Kuszemi: Somehow I think that has more to do with the fact that her house is eternally strewn with Usuki Sets, and you know how she always leaves things down to the last two minutes. All that frenzied running around. Grooming Parlour Shopkeeper: (giggles) Oh, tell me about it! Her parents can’t believe that there’s actually a whole, real game based on that, either! (opens the door and nearly bumps into a black-haired Usul with heavy dark eyeliner and a bright purple jacket). Oh gosh golly, I’m so sorry - WAIT, YOU? What are you doing here? Gothic Usul: Well, I might ask you the same question! I’m here to conduct market research. Grooming Parlour Shopkeeper: (splutters in indignation) But - but you can’t. That’s what I just did, you copycat. Gothic Usul: Watch me! What are you going to do about it, you pompous pretentious little prissy? Grooming Parlour Shopkeeper: You think you’re so cool just because you have a silly avatar to your name! 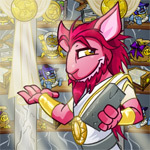 Most Neopians don’t even like you that much, they just want you for the shopkeeper avatar. Which doesn't even look that nice. Gothic Usul: Well, at least I have one! What do you have? Grooming Parlour Shopkeeper and Gothic Usul: (both Usuls turn around and glare at him) SHUT UP!